Bikes Without Borders organized a big Re-Cycling event in May. 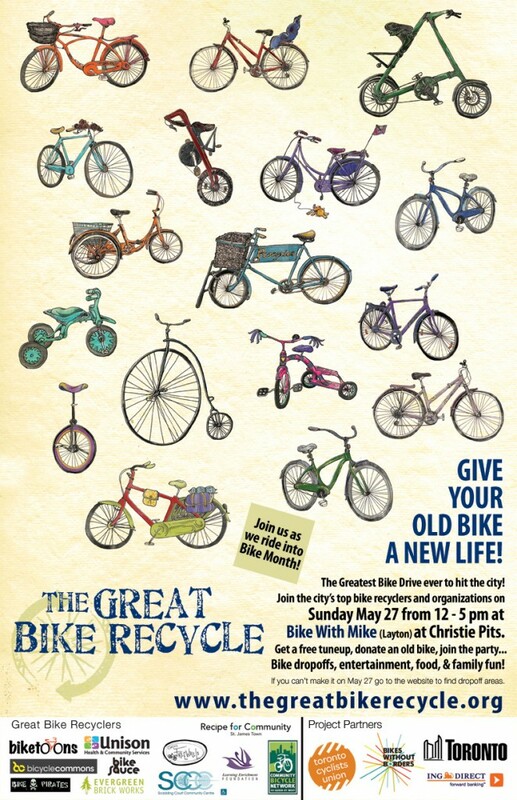 This was billed as the biggest bike drive and bike recycling celebration to hit Toronto, and a chance for the Toronto community to come together and see the amazing impact bicycles can make! The Great Bike Recycle bikes are for use in the St. James Town program. All additional bikes will be distributed evenly to our non-profit partners. If you missed this event, Bikes Without Borders is still accepting donations of old bikes throughout the summer. ING Direct Cafe (221 Yonge Street) check site link for hours. Parkdale – Please call Andrew at 647-704-5514 for specifics. This entry was posted on Thursday, July 19th, 2012 at 1:08 pm	and tagged with bikes without borders, great bike recycle, st. james town and posted in Uncategorized. You can follow any responses to this entry through the RSS 2.0 feed.